It's spoiler season once again, which means we are finally getting our first glance at the Commons for the upcoming fall release of Khans of Tarkir. While the entire Common pool won't be known until the full set is finally spoiled, this week a new Common cycle was disclosed that will have a major impact on the upcoming metagame. 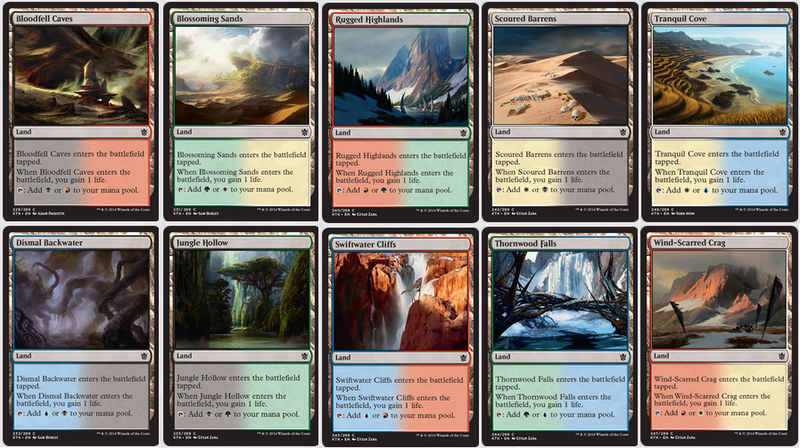 Called 'Refuge Lands' (from an identical cycle of Uncommon Lands from Zendikar), these ten duals will replace the Return to Ravnica Gates when they rotate out of Standard this fall. While not technically strictly better than the Gates (since Gate is a sub-type that affected other permanents), for all intents and purposes these will functional almost exactly the same, other than the small but not insignificant incidental lifegain when they enter the battlefield. It solidifies that dual-colored, enters-the-battlefield tapped, Lands can be printed at Common, even with a minor beneficial effect. It weakens Aggro strategies, in that it not only incentivizes players to play multiple colors, it also rewards them with extra life for doing so, helping them to survive early aggression. The latter is particularly potent in a format that already will include Radiant Fountain. It should allow players to utilize the best of the wedge and/or multicolor cards from the block effectively. Since such cards tend to be stronger (and thus more expensive), this will also push the format away from Aggro. So what do you think of this cycle of Lands? Let me know in the comments below. See you next time.